The footing for a building or structure is part of the foundation. A footing is the cement slab that is used to support a structure by distributing weight over a defined area. The amount of cement that is needed for the footing is obtained by calculating cubic feet. The cubic feet of cement required for the footings is calculated by using the dimensions of the slab that will support the structure. 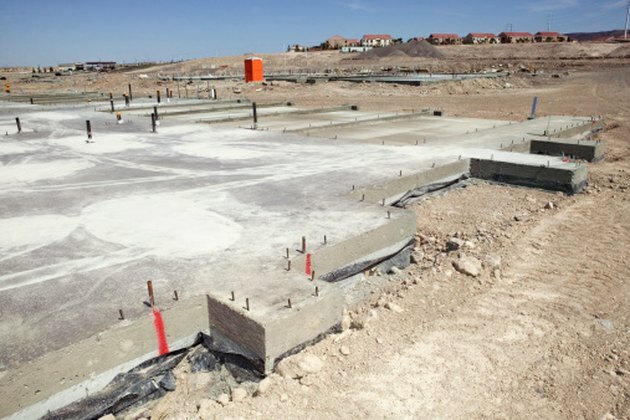 A footing is the cement slab that is used to support a structure. Determine the width and length of the cement slab in inches. Divide the width by 12 to convert it to feet. If the measurement for the width is 144 inches, the result is 12 feet. Divide the length by 12 to convert it to feet. If the measurement for the length is 240 inches the result is 20 feet. Determine the depth or thickness that is required for the footing in inches. Divide this number by 12 to convert it to feet. Multiply the width by the length and then by the depth. The result is the cubic feet of cement that you need for the footing.